An avenue of trees commemorates those who died in service or were killed in action during World War One. The original Avenue was pulled down as the highway was widened and divided in the late 1990s and early 2000s. The smaller plantation was replanted in 2005. 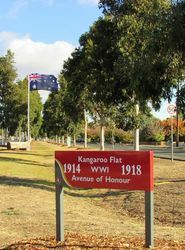 New signage and a flagpole has sinced been placed at the avenue. 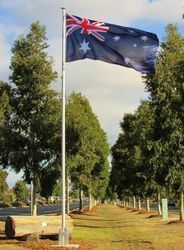 The Avenue was originally in the Shire Of Marong and the official Shire history indicates the Avenue was opened and dedicated in 1924 and a plaque unveiled by the President of the Shire. 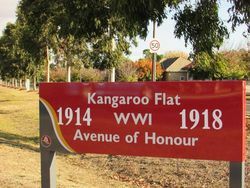 All of the trees had plaques for the men and women of the Shire who served in World War One, not just Kangaroo Flat residents. All of those plaques were removed during the road widening and are missing. fallen in the Great War.